Getting tired of plain old canned yam casserole at Thanksgiving? 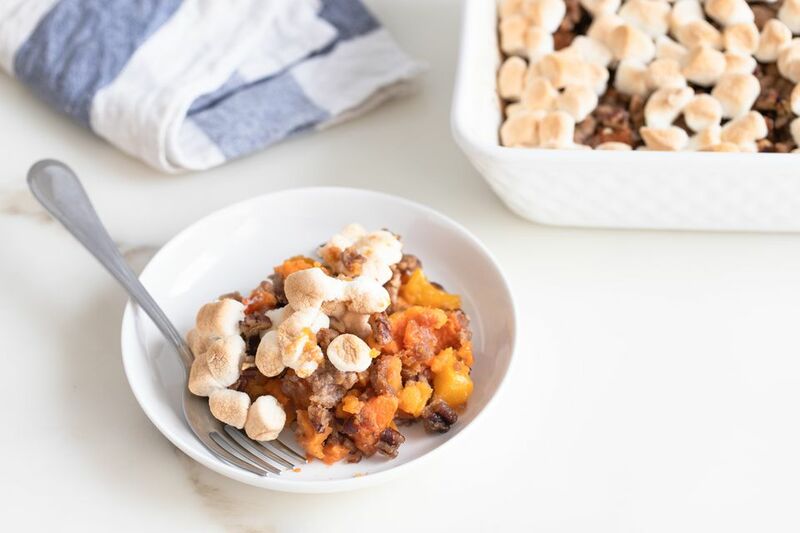 Give yourself and your family a break from traditional sweet potatoes and yams with this version that includes peaches. This easy recipe takes all of 50 minutes because you use canned yams (sweet potatoes) and canned peaches. If you're a purist, you can also use home-baked or boiled yams and fresh peaches. In a large bowl, slightly mash the yams, leaving large chunks. Fold in the peaches until well-combined. Pour into a 1 1/2-quart casserole dish. Sprinkle yam mixture with 1/2 cup chopped pecans. In a separate small bowl, whisk together the brown sugar, flour, cinnamon, 1/4 nutmeg, and salt. Using two butter knives in a criss-cross motion or a pastry blender, cut in the cold butter until mixture resembles coarse crumbs. Evenly distribute brown sugar mixture over the yams and peaches. Bake for 30 minutes. Remove from oven and set to broil. Cover the peach-yam casserole with 1 1/2 cups miniature marshmallows and broil until lightly browned.